Firefox Reality is a fast and secure browser from Mozilla that is designed for browsing the open web in Virtual Reality using standalone headsets. We have collaborated with content creators from around the globe to provide easy access to amazing VR experiences that can be enjoyed directly from Firefox Reality. Firefox Reality can be downloaded for VIVE standalone VR headsets by searching for Firefox Reality in the VIVEPORT store on your headset (and not the desktop VIVEPORT store or website). From the Oculus system tray at the bottom, press the Search button and enter Firefox Reality. 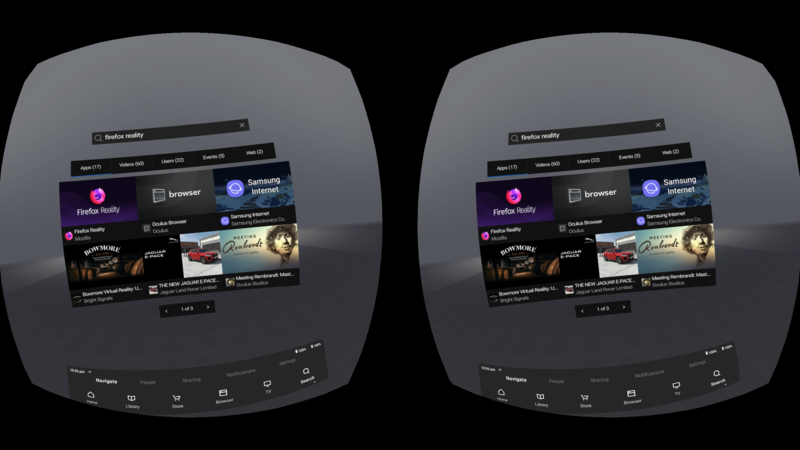 Or install Firefox Reality from the Oculus mobile companion app. Send an email for the Firefox Reality team to mozillamr@mozilla.com. Send a Slack message to our internal Firefox Reality #crow channel (Mozilla LDAP required).